Heartworm infection is acquired from the bites of mosquitoes that have picked up the larval form of the worms when they have bitten another infected dog. These larvae are carried in the saliva of the mosquitoes and are passed to another dog when they bite it. This dog then becomes the new host for the worms to develop into adulthood. In order for heart worms to survive in any geographic area, a very specific set of citeria have to be met. First and foremost, mosquito species that can carry the larval stage of the worms must already be present in the area. Not all mosquitoes can carry the infection. The larvae must be able to continue developing inside the mosquito before the mosquito takes its next meal and the transmission of the parasite to a new host can take place. For this to occur, the weather must be warm enough and the parasites will not continue to develop at temperatures below 57 degrees Fahrenheit. There must be dogs in the area already infected with adult worms and carrying the larvae so that the mosquitoes can carry them to a new host when they bite. Of course, this could also be wild dogs, coyotes or wolves, the parasites do not limit themselves to domestic animals. There must be dogs in the area that are vulnerable to infection with the parasite (i.e. dogs that are not on a preventative heartworm treatment schedule. The adult worms when they mate, produce live baby worms called microfilariae and these circulate in the bloodstream for up to two years, just waiting to be picked up when a mosquito takes a meal. After two years in the bloodstream, if they have not been carried to a new host, they die naturally. In order to mature into adults, these microfilarieae must be transferred to a new host, they cannot ever mature into adulthood within the same dog as their own parent worms. 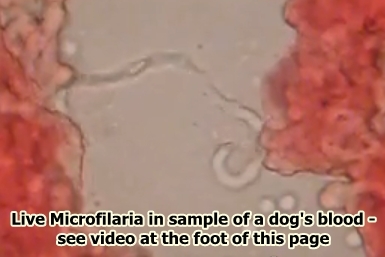 Take a look at the video at the foot of this page, it shows a live microfilaria in a blood sample from an infected dog. This is one of the reasons why a program of preventative treatment for dogs is vital, to kill the microfilariae so that they cannot be transmitted to another dog via the mosquito bites. Dog heartworm medicine for the prevention of heartworm is effective and safe. Find out more on the relevant pages of this site.